The event kicked off with a visit to Magills factory, boning room and retail store. Mike van der Hoeven’s son Ben, took the tour of the boning room and factory which was educational and engaging. 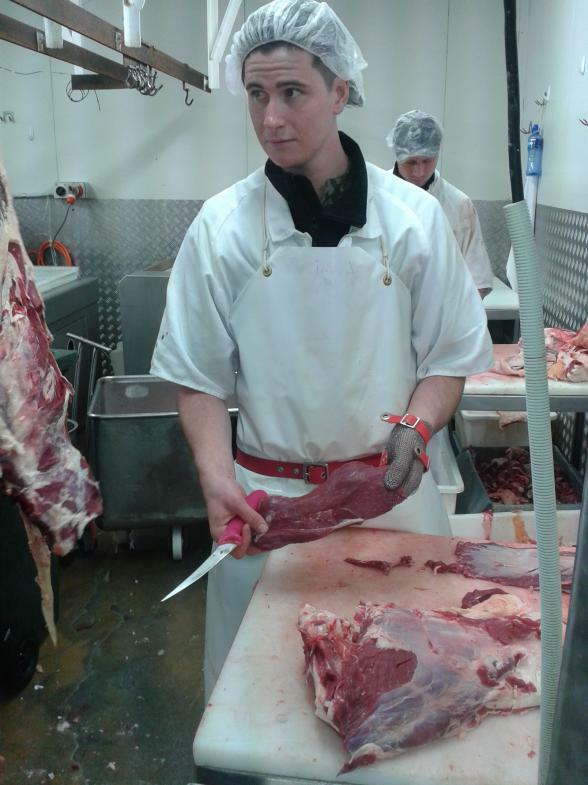 The group were able to ask Ben and his boning team to break down various parts of the beef carcase which provided a great opportunity for the chefs to learn where each cut comes from. Ben showed the group where the skirt steaks, ribeye, the eye fillet and sirloin among others, were all found. It was interesting to hear the talk among the chefs discussing the options in the Sky City restaurants for the various steaks. However, their imaginations were really captured when it came to looking at options for using sub primal cuts – fingers crossed that’s an aspect that might develop allowing Magills to market further sub primals. 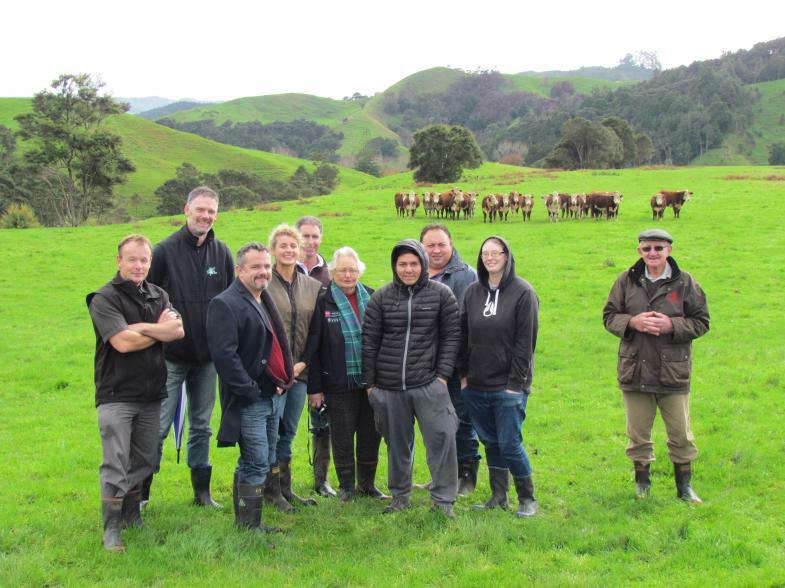 The “paddock” aspect of the day saw the group visit Hukaroa Station, home to Dean and Lisa Hansen and Hukaroa Herefords near Te Kauwhata. Dean and Lisa’s property was immaculate and with plenty of green grass, hill country, native trees and native birds around it was the perfect location for telling the story of the cattle behind Hereford Prime beef to our group of VIPs. A lot of effort had been made by the Hansen’s to present their cattle with lines of breeding heifers in various age groups presented along with a group herd sires. 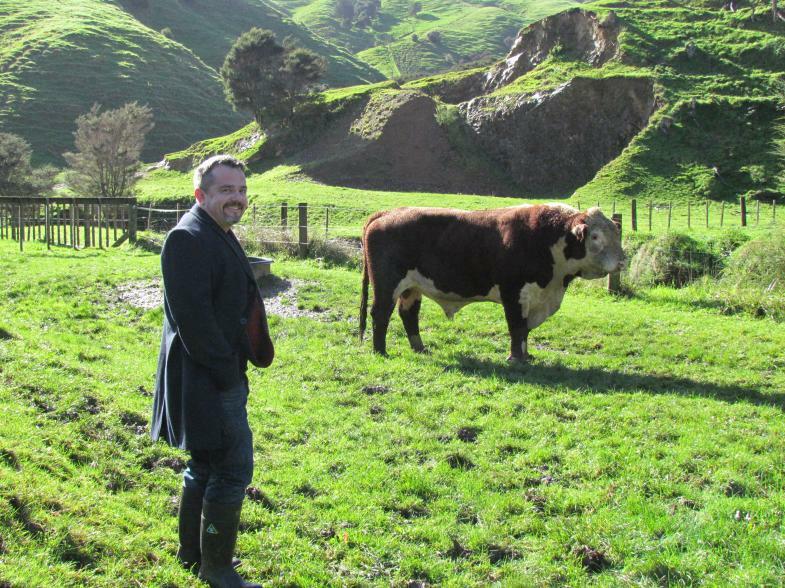 Adding an invaluable dimension to the visit was the fact that not only do Dean and Lisa breed Herefords but they also incorporate a good number of finishing cattle into their farm business which gave the group insight into the entire on-farm process and management. The group also travelled as far as it could up the airstrip to get a vantage point to take in the boundaries of the property and get an idea of the challenges and scale the Hansens manage. This drive and stop also allowed visitors to view a line of heifers that are being finished for Hereford Prime for consignment at a later date. The chefs asked some excellent questions and Dean and Lisa were outstanding with their answers and represented the breed and Hereford Prime brand exceptionally. The stud bulls proved a real hit and really caught the imagination of the group – their size and power the appealing factor. For the “plate” aspect of the day, guests dined at La Parrilla, SkyCity Hamilton’s, open grill Spanish restaurant. The two course Tapas menu was expertly put together by Head of Food and Beverage Nathan Hartley and his team. The menu showcased Hereford Prime beef and was complimented by the use of secondary cuts and seafood. The standout dishes included the HP scotch fillet, which was cooked using the sous-vide technique and then char-grilled over an open flame, ox tail croquettes and twice cooked ox tongue. Two loyal Magills and Hereford Prime suppliers with outstanding acceptance rates were invited to attend and it was a privilege for Hereford Prime to host the Tourniers and Comins for the evening. Hereford Prime extends its sincere appreciation to Dean and Lisa Hansen and the Magills team for their support of this event and helping make it happen. Action in Magills boing room. Sky City Hamilton head of food and beverage Nathan Hartley with one of Dean and Lisa Hansen’s herd sires during the Waikato Paddock to Plate event. The group of visitors to Dean and Lisa Hansen’s Hukaroa Station near Te Kauwhata for a Hereford Prime Paddock to Plate event. 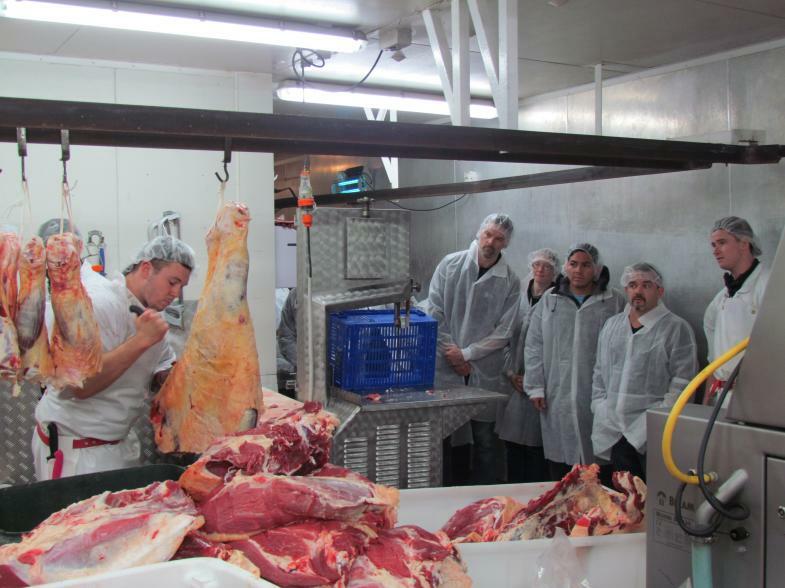 The group included chefs from Sky City Hamilton, Bidvest and key team members from Magills. Ben van der Hoeven completes his demonstration on where to find the beef skirt steak. 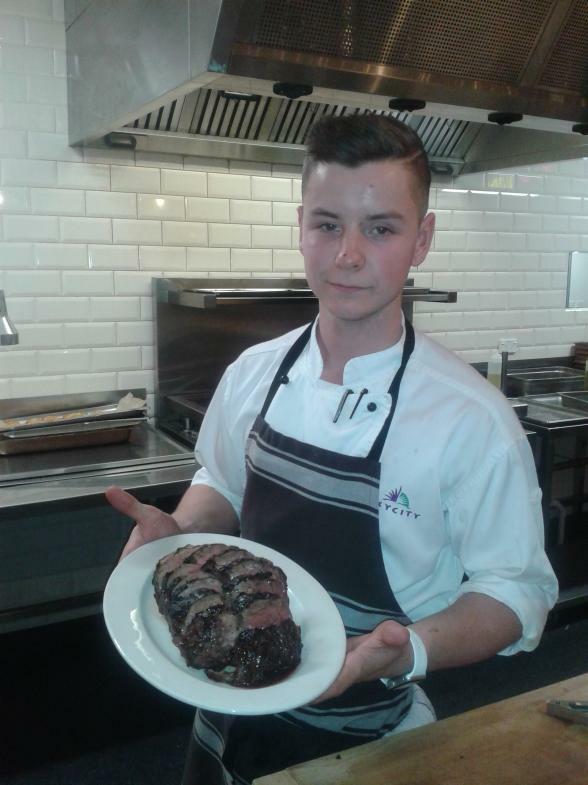 The delectable Hereford Prime scotch fillet was served to guests at La Parrilla as part of the tapas menu.